Can you feel the change in the weather on this first gorgeous day of fall? 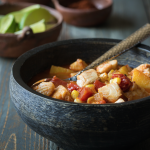 Warm up this weekend with a hearty Mexican Rockfish Stew to enjoy the gorgeous Colorado fall season. Seafood stews are one of my favorite meals to prepare. Simmering fish, hearty vegetables and a bit of heat from chile powder makes this stew delicious. I first learned to make fish stew from my mother who always made it during lent. She would always use cod, but any white flaky fish will work with this recipe. Serve with a squeeze of lime juice, a chunk of rustic bread and a dollop of sour cream for a perfect dinner. Take advantage of the hot deal on wild Pacific Rockfish fillets at Safeway – just $8.99/lb. through September 26th. You’ll only need half a pound to make this recipe and that small amount will yield a large pot of stew. The original recipe that is shown below came from Safeway, but I would suggest altering it a bit based on my mom’s way of cooking fish stew. I like to dredge the fish in a tablespoon of flour, seasoned with salt, pepper and chile powder before cooking in the pot. Then heat a teaspoon of olive oil in the pot and add the fish and cook through, turning once, about 6 minutes total. Once the fish is cooked, I remove from the pot, add a touch more oil and add the onion and garlic to sweat, then add 4 cups of water and the potatoes, corn and tomatoes and seasonings. Simmer the stew over medium high heat for about 30 – 35 minutes until the potatoes are cooked through. Add the fish back to the pot during the last 10 minutes of the stew cooking. This results in a more flavorful stew as you’re cooking with the fish flavors in the pot the entire time. You can also use seafood stock or broth if you have it on hand. Either way you make it – let us know how it turns out! 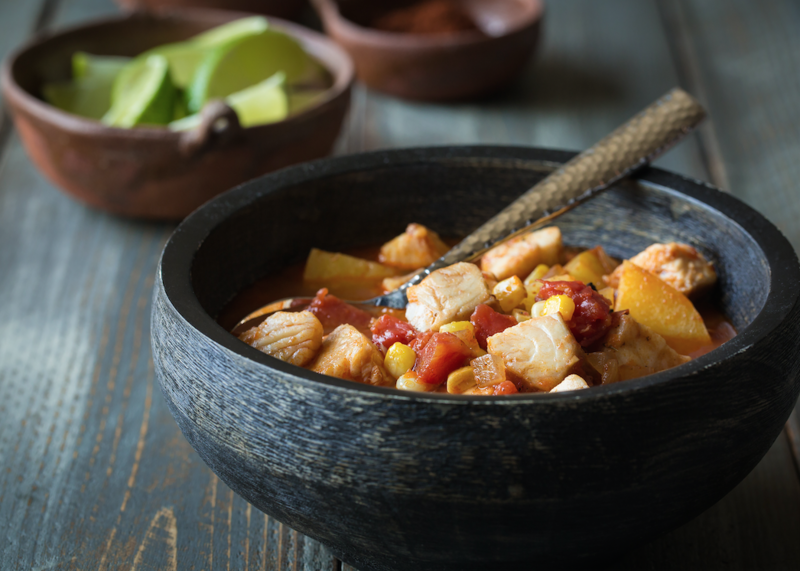 Hearty seafood stew made with Rockfish and bold Mexican seasonings. Delicious flavors sure to heat you up on a cool fall or winter night.